First day of School - LAAS Brescia. Maybe you remember your first day of school – the unfamiliar people, the different routine, the anxiety of saying goodbye for the first time. These experiences affect everyone in a student’s family, but the first day can be a joyous, monumental event with the right amount of preparation and positive reflection. Getting ready for the first big step reduces separation anxiety and helps create a positive association with school. All parents with school-age children have been there. On your child’s first day of school, walking hand-in-hand with your student, you ask yourself a thousand little questions, realize perhaps for the first time that this is just the beginning of a lifetime of goodbyes. Your lovely child is going to school, and you are having to let go. This experience is packed with emotion, but it can be a happy and peaceful transition. 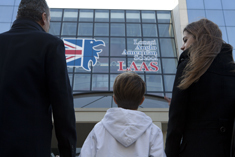 LAAS wishes to provide some helpful tips to make the adjustment a little easier for you both. • Introduce your child to common school activities ahead of time by drawing pictures, telling stories, playing with clay. • With your child, arrange to visit the school and classroom before the first day. Point out interesting things. Meet the teacher. • Work with your child’s teacher to prepare an easy transition and to answer your own questions regarding procedures. • Let your child select his/her backpack and lunch box in order to be part of the process. • On the first day, don’t panic or rush, account for traffic time, arrive on time. • Walk hand-in-hand into the school. This sets a precedent and shows your trust in the school. • Say goodbye with a smile, show your confidence, create your own ritual to use every day – a smile, a wink, a fist-bump. This creates reassurance. • Plan a special event after the first day, a kind of celebration for this unique rite of passage. Focusing on the positive, parents can make a great impact on how their student reacts to a new school environment.